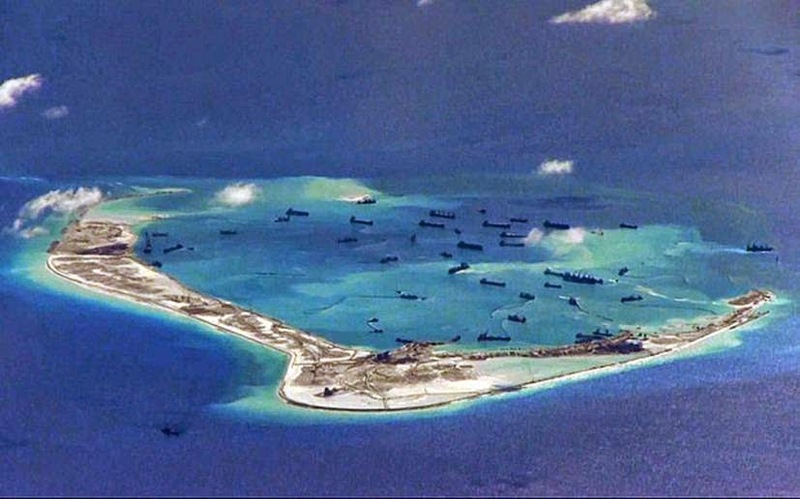 'China has placed artillery pieces on one of the islands it is manufacturing in contested waters in the South China Sea, a U.S. official told CNN Friday. The story was first reported by The Wall Street Journal. 'The Obama administration issued a rule on Wednesday putting more small bodies of water and wetlands under federal protection to ensure clean drinking supplies, a move that has riled some lawmakers and business and farming groups. The rule, issued jointly by the Environmental Protection Agency and the U.S. Army Corps of Engineers, is estimated to put about 3% more waterways throughout the U.S. under new federal jurisdiction. That will require a new federal permit to pollute those waters and could restrict access altogether…. And in the three cases where I could see supporting data about premium revenue and losses, those losses appear to be large. Moda of Oregon says that its claims were 139 percent of revenue, making for a margin of -61 percent. If I am reading their somewhat confusing table right, Health Service Corporation of New Mexico says it lost $23 million on revenue of $121 million. CareFirst of Maryland says that claims were 120 percent of revenue, which if we add in some money to pay for overhead, amounts to ... less than or equal to what they're asking from regulators. I can't find claims experience data for Tennessee, but that state told the Wall Street Journal that it lost $141 million on exchange plans last year. 'It seems clear from this exchange that the President either doesn't understand or flatly disagrees with the point Goldberg has in mind. Goldberg's point is that serious anti-Semites (that is, people whose worldviews are shaped and informed by Jew hatred as opposed to people who have, for example, a social prejudice against associating with Jews) don't understand reality the way that other people do. They see a world dominated by Jewish plots and secret cartels, and believe that the Elders of Zion rule the world behind a screen of deception and misdirection. This doesn't just mean that they have some quirky and unpleasant views. It means that they don't understand how politics work, why economies behave as they do, or how power is constructed in the modern world. As I wrote in an earlier post on this subject, "Jew haters don't understand how the world works; anti-Semitism is both a cause and a consequence of a basic failure to comprehend the way pluralistic and liberal societies behave. As a result, nations and political establishments warped by this hatred tend to make one dumb decision after another — starting at shadows, warding off imaginary dangers, misunderstanding the nature of the problems they face." 'China has vowed to step up its presence in the South China Sea in a provocative new military white paper, amid warnings that a US-China war is "inevitable" unless Washington drops its objections to Beijing's activities. In an editorial in The Global Times, a tabloid owned by the Chinese Communist Party through another newspaper, the paper described the construction of runways, harbour facilities and buildings on the disputed Spratly Islands as the nation's "most important bottom line". The article – which appeared just days after a US aircraft ignored repeated warnings from the Chinese military to fly a reconnaissance mission over the islands – said Beijing does not want a conflict with the US, "but if it were to come, we have to accept it." 'The exact timing of the Federal Reserve's first interest rate rise is uncertain, but even less clear is what will happen to the $4tn pile of bonds the central bank amassed during the financial crisis. Optimists take the view that, like a skilled pilot, Fed chairwoman Janet Yellen will be able to bring the size of the balance sheet down smoothly and steadily without hitting too much turbulence. Pessimists, however, believe the pilot is flying blindly through dense clouds with a faulty radar and constant risk of storms, making the policy normalisation process particularly risky. "For me the new thing to look out for is what they do to the portfolio," says Robert Michele, chief investment officer at JPMorgan Asset Management. "We know about moving the [interest rate] corridor. What we should be worried about is what they do with the balance sheet." The Fed's strategy for reducing its bloated balance sheet has evolved over time, but in September policy makers said the Fed will cease or start phasing out reinvestments only after it first begins increasing short-term interest rates. The balance sheet would shrink in a "gradual and predictable manner", but the details were left unclear — as well as the timing, which will depend on how economic and financial conditions evolve. 'The list of "observable behaviors" also points to so-called insider threats, and warns about individuals asking "unusual questions" about building maintenance or security procedures. Importantly, it speaks to the sheer volume of social media activity by pro-ISIS users, and the challenge that poses for analysts and investigators. "The large number of social media postings by US-based ISIL supporters is challenging for investigators in differentiating those supporters focused only on promoting pro-ISIL rhetoric, which may be protected speech, vice [versus] detecting those prepared to engage in violence on the group's behalf," the bulletin said. 'President Obama on Tuesday invoked U.S. military defense guarantees for Japan's disputed East China Sea islands that have been the target of coordinated Chinese military provocations since 2012. During a Rose Garden press conference with visiting Japanese Prime Minister Shinzo Abe, Obama repeated a promise to defend the Senkaku Islands, a statement that is likely to anger China, which claims the uninhabited islands as its own, calling them the Diaoyu Islands. 'Iran's Supreme Leader has said the country will not allow any inspections of its military facilities, the official state news agency reported Wednesday. 'A Moroccan man has been arrested in Italy over the Tunisia museum massacre that left 21 tourists dead after fleeing across the Mediterranean on a migrant boat. The Islamic State claimed responsibility for the March attack on the Bardo Museum in the capital Tunis which killed British mother Sally Adey. Abdel Majid Touil, 22, was arrested at the house where he lives with his mother and brothers in Gaggiano, near Milan last night. 'After exercising restraint in its nuclear weapons program for decades, China has made the poor choice of upgrading its arsenal in a way that raises concerns about its intentions, introduces new uncertainty in Asia and could add more fuel to a regional arms race. The unsettling development is China's decision to equip its most powerful missile — the DF-5 for Dong Feng or East Wind, which can reach the United States — with multiple warheads instead of just one. The information was reported publicly for the first time earlier this month in the annual Pentagon report on China's military and security programs. 'The maker of the Airbus A400M military transport plane that crashed in Spain this month is warning air forces flying the plane to carry out checks on the aircraft's electronic systems before the next flights. Airbus Defence & Space says it sent the so-called Alert Operator Transmission notice to all operators of the giant turboprop airlifter on Tuesday. The cause of the crash that killed two pilots and two flight test engineers on May 9 near the city of Seville remains under investigation. 'Two top Iranian generals on Thursday had taunted the United States, saying the much-discussed military option to destroy Iran's nuclear facilities is "ridiculous," that Washington knows it can't be done, and that their country "welcomes war with the US." Brigadier General Hossein Salami, the deputy commander of the Revolutionary Guard Corps, said in an interview on state-run television that a battle with the US would only serve to highlight Iran's strengths. "We welcome war with the US as we do believe that it will be the scene for our success to display the real potentials of our power," he said, according to a report by the semi-official Fars news agency. "We have prepared ourselves for the most dangerous scenarios and this is no big deal."